#1.1 5 Best Browning Gun Safes on the Market! #1.2 Why Choose Browning for Your Next Gun Safe? If you are the owner of a handgun, you want a safe that you can depend upon to give you a secure location that also allows you quick access to your firearm. Browning is a name that is synonymous with pistols, and they have developed great group of pistol vaults that you would find ideal to use to secure your firearms. Having a secure location to be able to store your pistol that is still accessible quickly in an emergency is an absolute necessity for most. 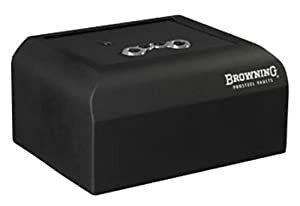 If you are a person who is looking for a brand that you can depend upon that has portable safes more options that you could attach to your bed stand or inside your closet, you can be sure that Browning has exactly what you are looking for. 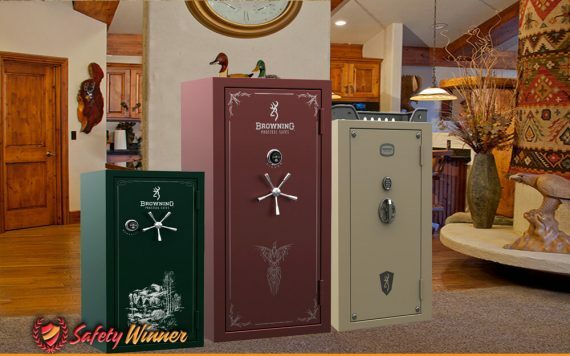 5 Best Browning Gun Safes on the Market! 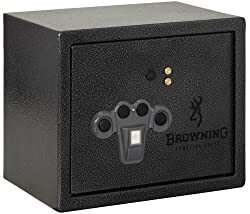 Browning offers a number of great safes, but if you are a person who is looking for one specifically for your pistol or other handgun, you can be sure that they have great options. Here are five you can have the ultimate amount of confidence in to fit your needs. Well constructed and durable using 10gauge steel. Easy to program and use for key touchpad. Impact resistant and built to resist attempts to break into the safe. Lightweight and easy to hide or store. Provides enough room inside to be able to store your firearm and a few accessories. The code will not open the safe on the first try every time. You may have to enter it a few times before gaining access. The design of the wiring can lead to it being pinched off, making the electronic code useless. Only a 90 day warranty provided. When you are looking for a quality pistol safe, you want something that is both durable and easy to use. That is where this Browning safe becomes the ideal choice. The size of this vault is 4.5 inches deep by 14.5 inches wide, by 11 inches tall. That is plenty of space for you to be able to store the pistol of your choice, and still have room for a few magazines, ammunition, and some other assorted items you may wish to store. The interior is well-designed, making it easy to store your weapon here, plus ensuring that it is well protected. The safe itself is designed to give you confidence that your weapon is well protected. It begins with the frame of the safe, which uses 10gauge steel. It is well-built, giving no seam where a person could break the safe open and it is impact resistant, being able to withstand a fall from a two-story building. You will love how the lid is designed in the locking mechanism. This is a digital, four key touchpad lock that allows you to program your own individual code. The lid is also made of a 10gauge steel, and is held in place by two ½ inch solid bolts which are extremely strong. The lid is spring assisted when opening. With the safe like this he won added security that it will not be taken and you will like the fact that this comes with all of the hardware needed to be able to secure the safe to a cabinet, floorboard, or other part of your home. An LED light is inside the safe to give you clear vision when you open the vault. Truly a fantastic option. Built with a heavy 14 gauge steel that provides great durability. Electronic keypad is easy to program and use. Provides interior light to make it easier for you to locate your items. Provides plenty of interior storage space, far more than most pistol safes. Lid is held in place by a pair of strong ½ inch locking bolts. Emergency key is provided and the safe allows you to use a 9 V battery as emergency power source should batteries die. Would be nice if it provided some kind of shelving for organization. For those who are looking for a larger sized vault that is perfect home or office, this may be the ideal choice for you, not only does the safe provide you with plenty of room to store your pistol or other handgun, but gives you a lot of additional space for you to be able to store other important items, including cash. For a pistol safe you are going to be impressed by the amount of room this product has to offer. It is 18 inches wide, 11 inches tall, and 9.25 inches deep, giving you a significant amount of storage space. Plus, you will love that the design is made so that you can easily attach it to a wall or even inserted as a wall safe. This is a durable little product, made of 14 gauge steel letting you know that you can depend upon it to protect your valuables. A set of locking bolts are included to help you to be able to lock the safe in place so that it cannot be easily removed. The locking mechanism uses an electronic four button touchpad which allows you to be able to enter your own personal code. It takes but a few seconds to be able to enter the code and gain access. The safe uses batteries to be able to operate the electronic keypad, but a key is included in case something should happen to the electronic lock. The interior provides you with plenty of room, plus you will love the fact that it uses an LED lighting system for the interior to help you locate the contents of your safe. This is ideal for those who want to find their firearm in an emergency without having to turn on the light. Allows you to store up to three handguns easily. Built with a durable 10gauge steel. Uses biometric sensor allowing you to simply access the safe using your fingerprint. Provides interior light when safe door is open. Enables you to be able to bolt the safe in place. Perfect for any location, including home, office, or when you are traveling. The battery pack may have problems connecting. No other complaints about this safe. Most pistol vaults are designed to hold one single firearm. That is where this Browning safe separates itself from many of the others, as it gives you the capability to be able to store as many as three different handguns, each of which is positioned to be able to easily grab and use at a moment’s notice. The safe is 11 inches tall, 14.5 inches wide, and 7.5 inches deep. It is that depth that allows you to be able to hold up to three handguns, and the safe is designed on the interior so that each handle is positioned upward, so all you have to do is reach into the safe and grab your weapon in an emergency. Of course, a great design is not the only thing you can count on with the safe. The body is made of a 10 gauge steel, which includes the lid as well. This gives you the confidence that the safe can handle a beating, and is impact resistant up to two stories. The door is held in place by a pair of ½ inch solid bolts, and the door is designed to be private is as well. This Browning safe uses the latest in biometric technology, as a keypad is included where you simply touch your fingerprint to unlocking the safe for you to gain access. A four button keypad is also included, allowing you to program in your own code in case you want to allow someone else to have access to the save who does not have their fingerprint imprint stored in the database. The interior not only gives you plenty of space to be able to store three firearms, but also comes with an interior LED light providing you with illumination when you open the safe door. Plus, there is sufficient room for the storage of ammunition, magazines, and some other small accessories. Why Choose Browning for Your Next Gun Safe? Reputation. Browning has long established themselves as an industry leader and innovator in the firearms industry. This is not only true with the types of weapons they make, but also with the kinds of accessories, including safes. Durability. You can have confidence in the safes that they make. All of them are made using a durable steel, somewhere between 10 and 14 gauge, ensuring that they are built to last while protecting your items from someone wishing to gain unauthorized access into your safe. Simplicity and Success. One of the things you will like about the Browning safe is that they are simple. The design is straightforward, ensuring that you can gain full use of your safe because of the simplicity used. Yet, you can also have confidence that that design is going to keep your valuables secure. Built to Fit Your Needs. Browning also provides a number of great safes that are specifically designed to fit your needs. 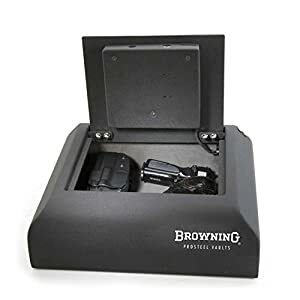 Whether you are looking for a portable gun safe to carry your pistol with you while you drive or you need a safe that can handle up to 64 long rifles, you can be sure that Browning has exactly what you’re looking for. Priced to Fit Your Budget. While producing quality safes, they are not looking to get out you either. You can be sure that the safes that they offer will fit within your budget, giving you the protection you need at a price you can afford.